Revisiting for the First Time: I finally read "Planet Hulk" – AiPT! Revisiting for the First Time: I finally read "Planet Hulk"
What made it so great? Can it happen again? I’ve got to admit, despite David Brooke’s glowing review, I’m nervous about Thor: Ragnarok. I hated the forced jokes cut with tragic death and threats of obliteration in Dark World. Like, pick one or the other. I know all Marvel movies have gags, but that one seemed like it was trying too hard to play both sides of the field. Here’s hoping Ragnarok just goes full-on Kirby crazy and doesn’t look back. And if I do end up hating the movie, at least some good came from it. It got me to read Planet Hulk. Yes, it’s another installment of “Revisiting for the First Time,” in which we look back at a classic comic, film or whatever that we somehow never experienced when it was hot, to see with fresh eyes why it blew up, and if it would have the same success today. Except this one will be a little different than the first edition, for Old Man Logan. As we figure out why 2006’s Planet Hulk was successful — and it’s pretty clear it also would be if released today — let’s see if we can’t learn from the decisions writer Greg Pak made and apply them to Marvel’s Legacy initiative, as the publisher tries to right the ship going forward. There’s no shame in looking to the past for inspiration. It’s obvious Mark Millar saw something he liked in Planet Hulk, and Old Man Logan was only published two years later. Where Pak was forced to come up with mostly new characters, Millar took advantage of the alternate timeline setting and presented tweaks on existing favorites, eliminating the legwork of creating players out of whole cloth. Both stories are absolutely bonkers situations that the reader is dropped into with no initial point of reference, despite being part of a popular character’s main title. We knew how Hulk got to Sakaar, though, whereas Old Man Logan opened cold, creating a mystery of “how this happened” that would keep readers coming back. If Marvel is really serious that in Legacy, “every series is an event,” then this is how to do it. While telling grandiose adventure tales, each book is a deep character study on what makes our favorite heroes who they are. Old Man Logan tries to keep that nature in check, knowing it can sometimes do more harm than good, while the Hulk lets his freak flag fly, serendipitously saving his world and gaining the respect he’d never had. That’s something you haven’t seen a lot of lately in Marvel Comics, which have hewn closer to the constant character growth seen in modern television dramas. It’s the kind of thing you want and expect from indie publishers, but is that really what we’re looking for in our long-standing supers? What happened to the old “illusion of change” practice? Pak pulls it off as well as it’s ever been done in Planet Hulk. The destroyer becomes the savior, almost accidentally, as his mighty deeds inspire an entire world and his very blood feeds the foodcrops, bringing life to a once-barren landscape. Hulk’s attitude remains the same until the very end, though, with vengeance and “puny” aplenty. It’s not until he uncharacteristically lets his guard down and relaxes that it all goes to Hell, putting the jade giant right back where he started — maybe even angrier. But it’s not all about Hulk. Pak was able to do one of the most difficult things in modern comics when he created new characters that resonated with people, so much so that two of them ended up in Ragnarok. Each of the Warbound have distinct looks and, more importantly, distinct voices, even to the point where they all have different speech patterns and colloquialisms. And like in the later Old Man Logan, there’s a bit of mystery — not every individual has their backstory detailed immediately, and when it does happen, it’s more of an organic part of the narrative. Not being the guy on the masthead allows these characters to grow, mostly unchecked, providing just enough meaningful change to make the whole thing not feel like its running in place. The Warbound are so compelling that the insertion of a somewhat random guest star, the Silver Surfer, feels out of place in hindsight. It’s one of the few missteps in Planet Hulk, along with a couple issues in the middle of the story that feel redundant and superfluous. The pacing is otherwise impeccable, with little apparent regard for how the tale would later be collected, having four stories spread out over 14 issues. Each issue builds off the last in both plot and emotion, barreling forward to the universe-shattering (but not really) conclusion. 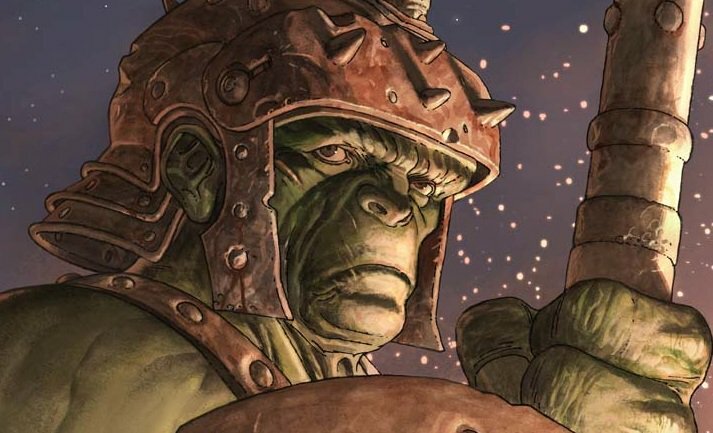 Planet Hulk teaches us that the main character has to count, and while readers might complain about the same old tropes, we secretly want to fistpump along with the classic lines and action that made us fans in the first place. And contrary to the TV-inspired “seasonal” model that Marvel has taken on, maybe the publisher shouldn’t be so afraid of long runs with events that build on each other. The anticipation for World War Hulk was molten after seeing our hero finally get his big win, only to have it ripped away. If those who do not heed history are doomed to repeat it, then those who study what’s come before can surely replicate the best parts. Marvel Legacy can learn from the most successful, modern stories that superheros are not indie books — to many, they’re the comfort food of publishing. You can change up the garnish a little bit, but give us what we expect and we’ll leave fat and happy, ready to come back and indulge again next month.